Incredibly tasty, impressively hot – add half a teaspoon to your pot ! 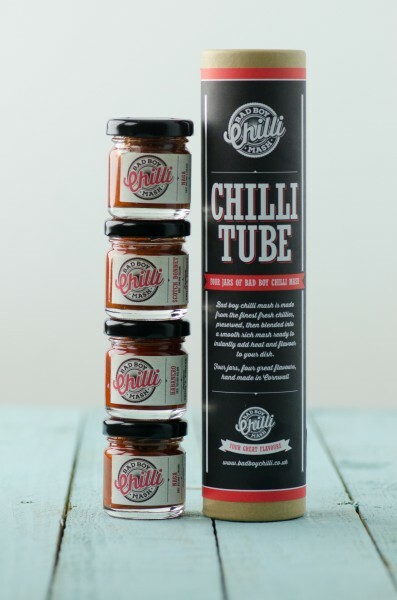 Included in the Chilli Tube are a selection of four jars of the finest Bad Boy Chilli Mash and a recipe and instruction sheet all wrapped in this great gift pack. It wasn’t long before, from his Cornish-grown stock of hot and fiery peppers, he started making chilli mashes for friends and family. Everyone loved it! The secret to Bad Boy chilli mash is using the freshest chillies, preserving them, then blending just at the right time to keep the lovely flavour of the chillies locked in the mash whilst still retaining the heat.